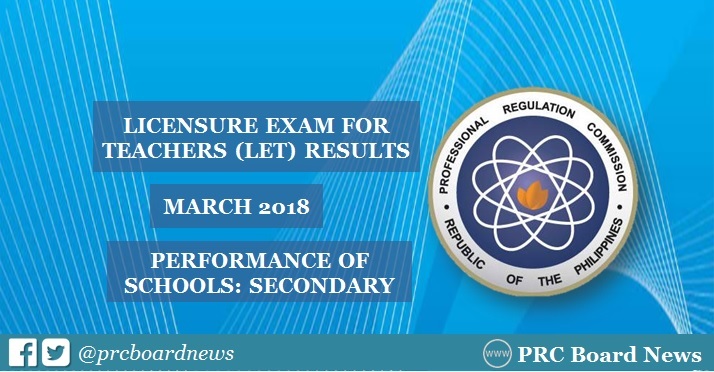 MANILA, Philippines - The Professional Regulation Commission (PRC) released results of March 2018 Licensure Exam for Teachers (LET) also known as Teachers board exam on May 23, 2018 or in 40 working days after the exam. Those awaiting results can check on this page for the list of top performing schools as well as the performance of schools for Secondary level board exam. The first LET board exam this year was administered on Sunday, March 25, 2018 in at least 20 testing centers in the country: Manila, Bacolod, Baguio, Cagayan De Oro, Catarman, Cebu, Davao, General Santos, Iloilo, Kidapawan, Legazpi, Lucena, Occidental Mindoro, Pagadian, Palawan, Romblon, Rosales, Tacloban, Tuguegarao and Zamboanga. PRC named University of the Philippines - Diliman (UPD) as the top performing school in the March 2017 LET Secondary level exam, 92.54% or 62 out of 67 successfully hurdled the exams. Univerity of Santo Tomas (UST) came in second spot with 80.95% or 51 out of 63 passed. In the March 2016 exams, UPD also dominated the schools with 93.44% (57 out of 61). Saint Louis University (SLU) placed second with 92.18% or 165 out of 179 passed. According to PRC Resolution No. 2017-1068, which deals with the 'Schedule of Licensure Examinations for Year 2018, the target release date of March 2018 LET board exam results is on Tuesday, May 22, 2018 or in 37 working days after the exam. People may view details of school performance through site information as it works for good go ahead in life making for the http://www.pulmonaryfellowship.com/full-list-of-necessary-pulmonary-eras-fellowship-documents/. people may view things on net and decide future for their children for such institution. Ranking of schools seen in web site as their performance and results of the children by http://www.sopformat.com/best-internship-statement-of-purpose-format/. many schools perform better and it make their name as big one for good knowing and people prefer their child to get admission in such ones. On line job findings are best one as it leads for the function of things in right way and solution of things for good return in see more details reply. The matter of ideal support ended in real require ways as simple apply return in good job for the job seeker. The more work id done with the schools, the more time and good result they give in result and this is the limit of time in this case as well when only here they have the time to share with the rest of the world.